A RUP LIFE: TOM AND JERRY’S GIANT ADVENTURE ON BLU-RAY™ WITH ULTRAVIOLET™ AND DVD! 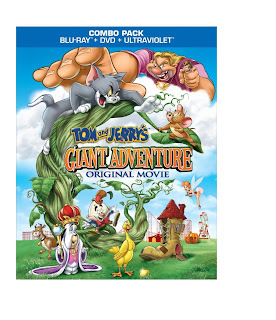 TOM AND JERRY’S GIANT ADVENTURE ON BLU-RAY™ WITH ULTRAVIOLET™ AND DVD! Now available: TOM AND JERRY’S GIANT ADVENTURE ON BLU-RAY™ WITH ULTRAVIOLET™ AND DVD! This was our latest movie night movie! Who doesn't love Tom and Jerry!! Legendary fairy tale characters come to life in Warner Bros. Home Entertainment’s (WBHE) brand-new, full-length animated adventure, Tom and Jerry’s Giant Adventure, set for release August 6, 2013. A fresh, new adaptation of the classic tale Jack and the Beanstalk, Tom and Jerry’s Giant Adventure tells the story of how the popular cat and mouse duo team up with a young boy named Jack, as they journey to Fairyland and confront a greedy giant named Ginormous. Tom and Jerry’s Giant Adventure will be sold in both a Blu-ray™ combo pack (includes both the Blu-ray™, standard DVD and UltraViolet™ editions of the film), which retails for $24.98 SRP and on standard DVD for $19.98 SRP. It’s super-sized fun for the whole family with Tom and Jerry’s Giant Adventure, as the tussling twosome star alongside famous characters from classic children’s literature and legendary nursery rhymes in an exciting, animated re-telling of the beloved classic, Jack and the Beanstalk. Viewers will meet Peter Pumpkin Eater, Humpty Dumpty, the Three Little Pigs, Little Red Riding Hood, Little Bo Peep and many other famous storybook characters as they mix and mingle with classic cartoon personalities including Droopy Dog, Barney Bear, Tuffy the Mouse, Screwy Squirrel, Spike and Tyke and others in a magical story that will delight both kids and adults. In Tom and Jerry’s Giant Adventure, nine-year-old Jack and his mom Violet have fallen on hard times when their fairytale-themed amusement park, Storybook Town, falls into disrepair and thus fails to attract the patrons it once drew. Unless they come up with a mortgage payment, the park will be torn down and replaced by a strip mall. Forever optimistic, Violet and Jack refuse to give in and live by the adage “dreams come true if you believe.” To come up with part of the mortgage, Jack sells their beloved cow, Hermione. Tom and Jerry, who are all that’s left of Storybook Town’s petting zoo, accompany young Jack, who trades Hermione to a mysterious stranger named Farmer O’Dell in exchange for magic beans. Jack’s mom is upset Hermione was traded for beans. Tom and Jerry, however, know there is something uniquely distinctive about these beans and bury them in the soil. As night falls on Storybook Town, Tom, Jerry and Jack fall asleep but are soon awakened by the magic beans, which have formed a giant beanstalk that shoots up like a rocket above the clouds and carries the trio to Fairyland – a magical place, high in the sky. In Fairyland, Tom, Jerry and Jack meet several characters from legendary children’s stories and nursery rhymes. They also meet Ginormous, a greedy, tyrannical giant with a keen sense of smell, who terrorizes everyone in Fairyland. Jack realizes he’s living the role of “Jack” in Jack and the Beanstalk and learns it’s his destiny to fight Ginormous and free the citizens of Fairyland. Tom and Jerry join in, in what turns out to be an unforgettable epic adventure that promises to leave viewers sitting at the edge of their seats! Originally created by William Hanna and Joseph Barbera, Tom and Jerry emerged during Hollywood’s golden age of animation and became one of the most popular cartoon series in existence. The shorts focus on the never-ending rivalry between Tom the cat and Jerry the mouse. The plots of each short usually center on Tom’s attempts to capture Jerry. Jerry however, is clever and quick on his feet, thus ensuring that Tom hardly ever manages to catch him. You can purchase your copy at your local retailers or online at Amazon!